Who would steal her innocence first? The dark-haired hottie in her new high school...or the mysterious danger lurking in the woods behind her house? All Mint wants is a stable life, to stay in one place long enough to finish out the school year, but her single mom, with a pension for bad relationships, has done it again and now Mint is stuck in a small country town that gives her the creeps. But after she meets Ben, a dark-haired senior at her new high school, Mint may just have found a reason to be glad for yet another move--if only Ben wasn't suspiciously linked to the mysterious death of a high school girl. 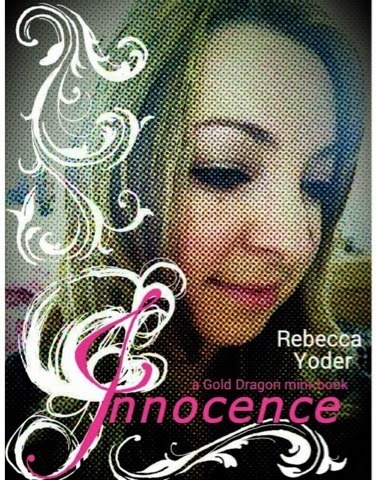 Innocence is the first mini-book (a book less than 10 chapters long) in the Gold Dragon Series, a tale of relationships, mystery and a paranormal being lurking in the woods that you've never seen before. If you are innocent, you may be the next victim. I had extremely low expectations. Though Rebecca is lovely, the plot didn't sound great. But I was wrong, very very wrong. Innocence started of great before I even started the story because in the little disclaimer and copyright section, she put "All the characters and events are fictional, except for Mint sitting alone in the cold, dark trailer waiting for the heat to be turned on. This actually happened to me." which just made me giggle because I often feel like you don't really know what the author is like through the book. Anyway. The characters in this book were quite mysterious, mainly because the book was so short but Rebecca really knows how to use that to her advantage, by saying something like "You sound like you got into a pack of my mushrooms". Which gives you a teeny bit of information but just never telling you what that really means. Also I feel like whima is going to be one of my favourite characters because she was so quirky and odd. The plot was great as I have already mentioned I really liked the writing style. The fact that in 38 pages I knew the personality of all the characters and a bit about their backgrounds. I can't talk about character development because there wasn't enough pages for development but I can tell there is going to be an amazingly written development throughout the series. I'm giving this book 4/5 stars. I really enjoyed it. It didn't take long to read, which is nice because every once in a while it's nice not to read a 500 page book. So excited for the next book, which is coming out in a week to a week and a half. You can get 'innocence' on Etsy, Amazon and iBooks.